For homeowners in New York, the memory of Hurricane Sandy in 2012 still brings up unpleasant memories and many continue to live with the damages that occurred. 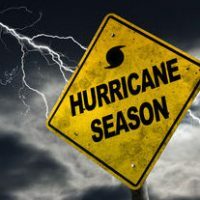 At Cavallo & Cavallo, our real estate attorneys want you to be prepared for whatever the current season holds, and have assembled this list of tips to make sure your home is storm ready. The 2018 hurricane season started June 1, and experts are already warning that it is likely to be active with the potential for several severe storms. Forecasters with the National Oceanic and Atmospheric Administration (NOAA) estimate that there is a 75 percent chance of it being between the normal to above normal range in terms of the number and strength of storms. They predict as many as 16 named storms, with up to nine categorized as hurricanes with wind gusts of 74 miles per hour or greater. There is an at least 70 percent chance of up to four category three storms of greater, with wind gusts of up to 111 miles per hour. Clear away debris from your yard. Cut down dying or damaged trees and trim loose branches which could fall on your home or become projectiles in high winds. Clear out your rain gutters and make sure they are tightly secured to prevent them from coming loose in a storm. When they are clogged with leaves or other debris, it can cause damage to your home. Retrofitting can help prevent some of the damages associated with hurricanes. Modify or add new structures to make your roof, doors, and windows more secure. Purchase a portable generator now. Once a storm is approaching or immediately afterward, they will be difficult if not impossible to get. Just remember to keep it protected from moisture and only operate it 20 feet away from doors or windows. Consider building a FEMA safe room, which is a structure designed to withstand high winds and other hurricane related conditions. You can modify one of the existing rooms of your home for this purpose, or build one outside as an addition to your property. In addition to the above, take some time to review your homeowners insurance policy now and make any updates as needed. Assemble a hurricane survival kit that contains food, water, flashlights, and a first aid kit, and make sure all your important documents are kept in one safe location. At Cavallo & Cavallo, we are your neighborhood law firm. We are here to help in whatever way you need, whether you are buying or selling property, as well as when the unexpected occurs. Reach out and call or contact us online today and request a consultation in our Bronx or New Rochelle office to see how our experienced New York real estate attorneys can assist you.